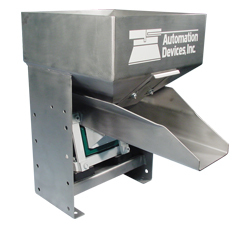 Automation Devices combines superior resources with 55 years of experience to build hoppers and pan feeders known for quality and reliability. We maintain ample inventory of more than 15 different models ensuring rapid delivery times while maintaining flexibility to serve a variety of industries. Our hoppers and feeders can be used in a variety of situations from general purpose to being suited to meet exacting FDA standards. 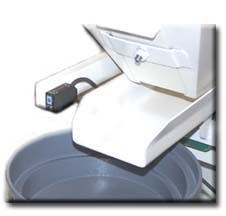 The pan's shape keeps parts from going over the sides and also precludes the possibility of parts jamming between the pan and the bin's discharge funnel. The Pan Feeder Hopper conveniently provides extra parts storage and serves as a bulk delivery system to maintain a proper parts level in a feeder bowl. Innovative systems designers have expanded the use of a Feeder Hopper to include parts delivery to packaging stations and to convey bulk materials. A hopper serves any application where a storage requirement is coupled with a need to convey a product to processing equipment. Pan Feeder Hoppers store parts and deliver those parts to other devices on demand. During a portion of the electrical cycle, power is applied to the electromagnet. When energized, the electromagnet pulls back and down on the armature which is attached to the pan assembly. When the electromagnet becomes de-energized during the second half of the electrical cycle, the armature and pan are released and spring forward and up. The pan assembly is mounted on leaf-type springs which allow the pan to move in a back-and-downward motion (power cycle) and in an up-and-forward motion (release cycle). These combined motions cause parts on the pan to move forward until they drop off the pan. 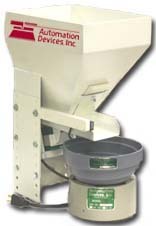 An optional amplitude controller, Model 6000 Series, regulates the amplitude of the pan's vibration, adding a measure of precision to the part delivery rate from the hopper. To prevent the Pan Feeder Hopper from overfilling the using machine, Automation Devices makes the Model 8650 Level Control Switch. ADI lists the specifications for all available adjustable hopper stands. 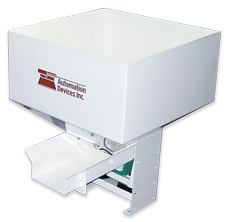 The pan feeder hopper is one style of many that ADI designs and builds.